Following the launch of my first book I received an invitation today to speak to the Waterford Archaeological & Historical Society annual lunch. I decided to give a short presentation about one aspect of the local heritage which is featured in my book, that of the Cheekpoint Mail Packet Station. In an era of rapid and perhaps instant communication, it might come as a surprise to younger readers to realise that in the past, communication was a slow and very often weather dependent activity, involving stage coach, ships and very hardy individuals. 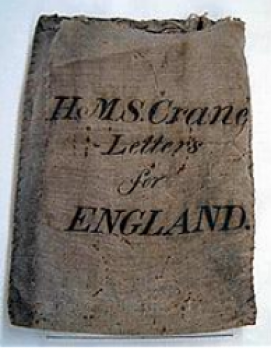 The Mail Packets of the 18th and 19th Century were the means by which such communication happened and had originated in Tudor times to essentially carry packages to and from British embassies, colonies and outposts. The mails to the Waterford area at that point were an ad hoc affair, and a great account can be gleamed from the visit of Arthur Young to the area in 1776, indeed it is arguable that we would not have had his visit but for the precarious nature of the packets at the time. We’ve met with Young before. 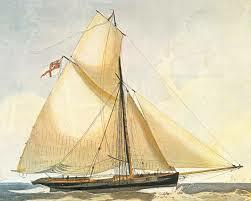 He had traveled the country on an agricultural tour and was to embark a packet at Passage for a return to England. The captain made all manner of excuse not to sail though, and realising the delay was to build up a passenger manifest, the traveler decided to invite himself to Ballycanavan, then seat of the Bolton estate. At the time the Packet boats had evolved to carry packages of business/government and domestic mail, passenger, and freight transportation between European countries and their colonies. However the service out of Waterford, and based at Passage East was a privately run operation, carrying post, but depending also on passengers and freight to generate income. The official postal route between London and Ireland was Holyhead to Dublin. In 1790 Thomas Owen was given a 7 year contract to the value of £1,200 PA to run the service. He lost this however to Samuel Newport in 1793, (Antell: p20) but we can only speculate that Owen continued to manage the service on Newports behalf. 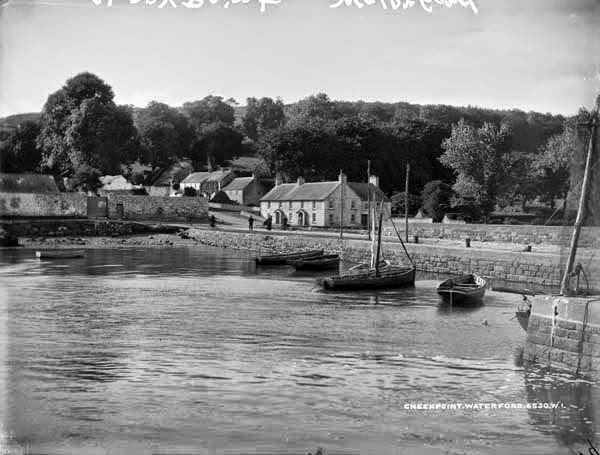 In 1810 plans were announced to develop a new harbour at Dunmore east and with the death of Thomas Owen in 1813 the packet moved, initially to Passage and eventually to Dunmore East in 1818. In 1834 the service relocated to the city of Waterford and continued to run to 1850. The criticism against using the harbour at Cheekpoint was its distance from the harbour mouth. Sailing ships had to depend on tides and wind to aid their journey up river. However, steam power was already on the way, and its interesting to note that as early as 1824, they were employed on the Milford – Dunmore route. (Antell: p37) One can only speculate that if steam had been introduced a decade earlier that Cheekpoint may have continued to hold it’s place, and the village as we now know it would have looked considerably different. This months guest blog is courtesy of Fintan Walsh and I think it prepares us for the upcoming month of December, which for us here in Waterford is going to be about commemoration. 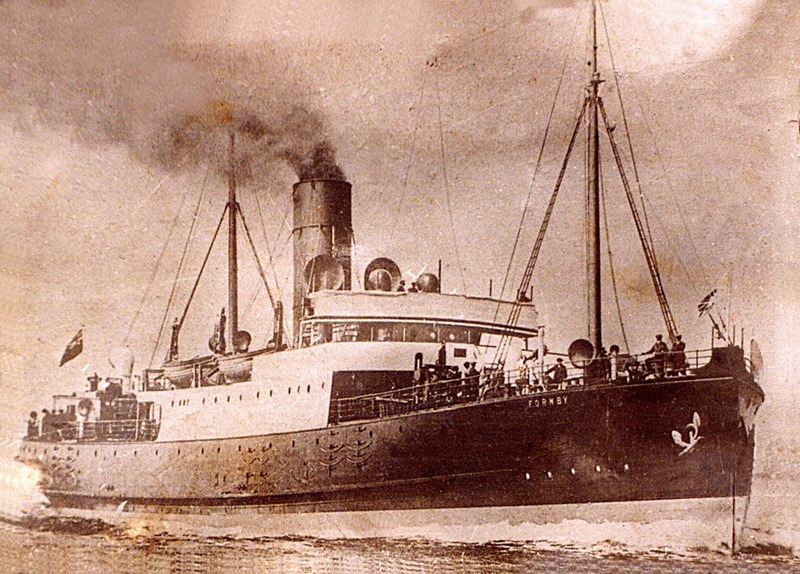 For it was December of 100 years ago that Waterford’s worst maritime tragedy occurred. 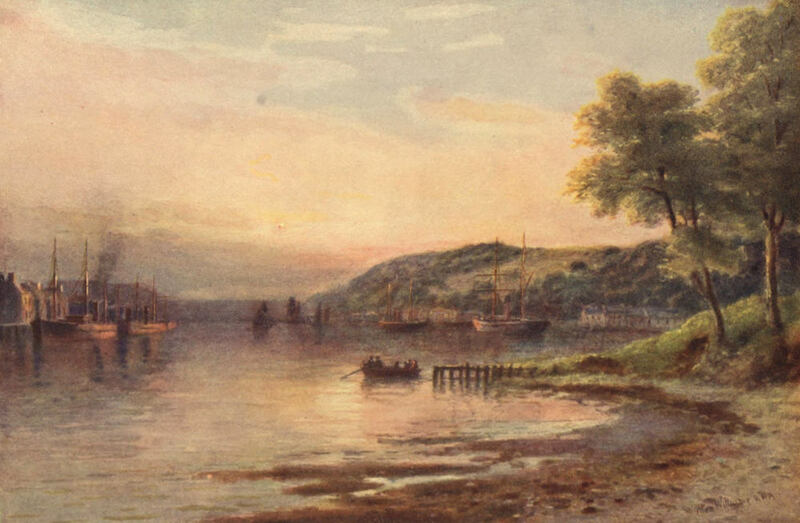 However, a maritime area such as Waterford harbour has seen it’s fair share of tragedies. The following remarks by Fintan sets out to capture the scale of this loss in the harbour area alone. They include some very harrowing and poignant stories, including two from my own family. Its a fine piece of research in itself, but also a wonderful piece of social history, and I was thrilled that Fintan was willing to share it. A few weeks ago Michael Connors Chair of the present Passage East and Crooke Development Association asked me if I would put a few words together for the Opening of the Memorial Garden on June 13th 2015. Not being a historian but with an interest in my own place I beforehand apologise to the family of someone I may leave out due to human error or not knowing the fact. I will start with all those lost in our estuary down as far as the Hook in Co Wexford and Creadon Head in County Waterford since 1900 and also include anyone from the area who were lost outside the harbour but will cover those lost in the two World Wars separately. 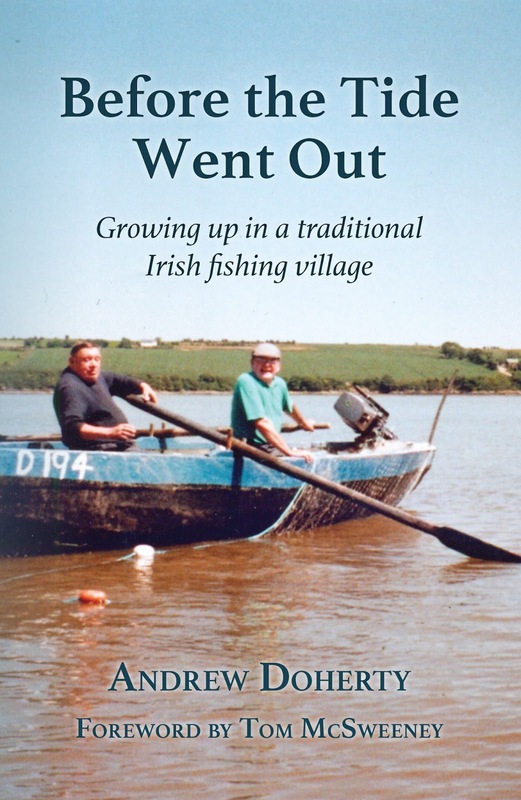 First of all it’s true to say that all the villages along the River Suir in County Waterford and Wexford since time began relied on the river and the sea and fishing for a living. Now I’ll take ye back to the forties and fifties in the Passage. I grew up in and the fishing scene in the Harbour. At that time all the Weirs up to Cheekpoint were very active as were the Bags on the bank near the Spit Lighthouse, the salmon fishing season from February 1st up to August 15th had numerous boats on the river with plenty fish landed, the herring season in the winter saw boats come in full to the gunnel’s, trawling was also very much part of the scene as was scoping for mackerel during the summer season. Contrast that to the present time with all fishing practically gone, what happened to all this one may well ask; As a personal viewpoint I would say when Ireland joined the EEC in 1973 the lot of the Irish inshore fishermen took a downturn and the results are clearly visible to day for the worse. Generations from the areas at both sides of the estuary also went to sea to earn a living, my own father told me that one night in the late nineteen twenties when he went ashore in Rio De Janeiro to the Seaman’s Club he met 17 others from the area the majority on different ships. I thank the previous Development Association Committee whose idea the Memorial Garden was and acknowledge the great work they did carried on by the the present one. I now list by name to the best of my knowledge all from the areas lost since 1900 starting in the Harbour. Before going through the list its fair to say where people have been drowned with no survivors from the incident and no witnesses it is only speculation as to what actually happened. In the estuary I have gone back to the early 1900’s. The first tragedy took place here in Passage when Thomas Delahunty Kilcullen aged 18 yrs was drowned while swimming in late July 1908. The second name that cropped up was that of my own grandfather Paul Walsh, my fathers father, who went out in a boat to take a pilot off a ship and his boat capsized just above The Point or Hell Point in choppy conditions and he was drowned on St Stephen’s Day 1912. On Christmas Day 1914 the mate of the Duncannon steamer that plied between Waterford and Duncannon and calling in to Passage on the way was drowned after slipping in to the water at Passage Pier between the ship and the Quay his name was Martin Breen. On January 14th 1920 three lost their lives from Passage when the yawl owned by Rd Galvin capsized the three were William Elliott, William Parker and Pat Organ. Galvin clung to the upturned boat and was saved. 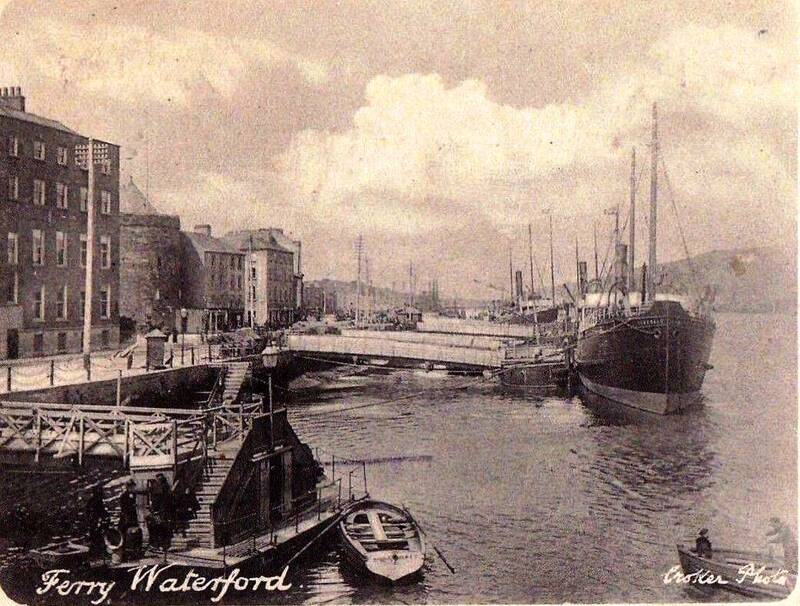 In November 1931, Fred Murphy from Passage, a boatman was being towed up to Waterford by a steamer heading for Halls Grain Store to be moored by him but when they arrived in Waterford he was missing. 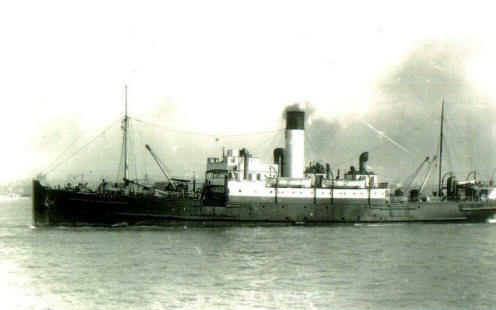 On 10th December 1937 Michael Cahill, Passage, father of Tom and Nancy was lost when his ship foundered when its cargo shifted up off Belfast Lough. In April 1939 John Furlong an uncle of John’s and Patricia’s was accidentally killed aboard his ship. On a Sunday in November 1940 two men from Ballyhack were coming across to Passage in a punt in choppy conditions Robert Keating and Thomas Whitty. Thomas was coming over to make final arrangements for his wedding three days later to Mary Elliott from Passage, Keating was to be his best man. 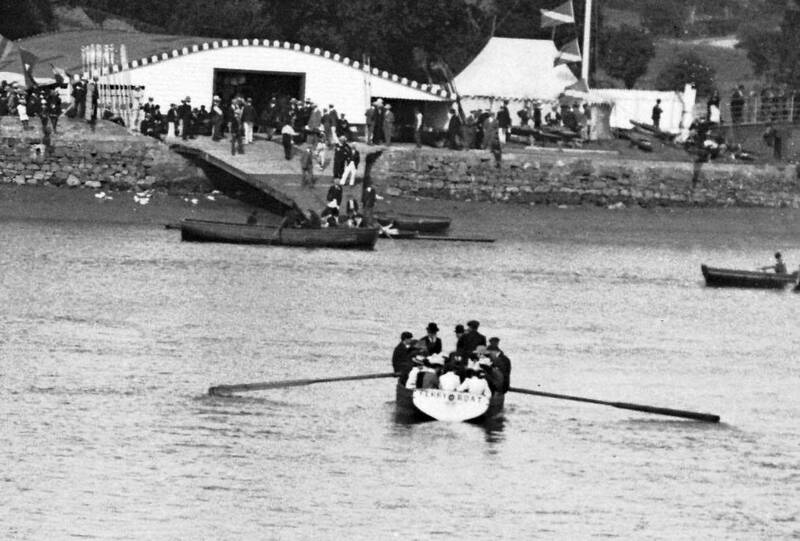 Half way across they were noticed to be standing up in the boat waving frantically as if they had lost their oars but then the boat capsized. Even though help arrived within some minutes they were drowned. Whitty’s body was recovered with his letter of freedom and wedding ring in a pocket. Ironically Keating had survived on a raft for three days at sea the year before. Less than a month later Whitty’s father Paddy Whitty was drowned when his ship was sunk during the second war he was expected home for Christmas and had not been informed of his son’s death. Four and a half year old Ned Robinson Brookside Passage son of Philly and Annie was drowned in October 1947 and the theory is he fell over the Quay in Passage his body was recovered up river the following day. Frances Kennedy aged 2 from Passage was tragically accidentally drowned not in the Suir but in Bone’s Yard in the village of Passage where the Ferry Offices are in a water barrel. The tragedy that saw the biggest single loss of lives from the area occurred on a good enough night in November 1949. Four from Passage were fishing for herrings in Jim Kirby’s motor boat down near the mouth of the harbour, Joe Robinson, John Joe (Killy) Kirby father of Jim and Willie Rogers Madeline’s brother all related as well as Willie Keating, Dobbyn St and all were lost in what could be called a mystery of the sea, the main theory being they sunk after taking in a large catch of fish. Joe Robinson’s brother James Robinson (The Masoner) was drowned in Newcastle on Tyne a few days later the same week falling between his ship and the Quay. In March 1950 Ben Kavanagh Passage was found drowned over the strand underneath Crooke Church at the waters edge and his faithful dog Don was beside him. A month later in April 1950 Dave Pepper Passage died while out fishing. John Fowler, Blynd Quay, Passage aged 19 was drowned while trawl fishing with his father Paddy in a motor boat up near The Gas Buoy, in January 1952. The boat was only purchased a short time before the tragedy and had been converted and quite easy to go overboard from, a very sad time for the Fowler family, especially the father, they lost a daughter of 17 Margaret two years before due to meningitis. Martin Lucas from Crooke died in Drogheda Docks in April 1956. John Ferguson, Cheekpoint was washed overboard from a ship in January 1957 and was lost, and Joe Doherty, Cheekpoint also drowned that month (My uncle Joe, who fell between his ship and the quayside in Port Arthur Texas A.D.). In April 1960, Tom Baldwin, Passage was drowned off the Quay in Passage on a Sunday afternoon. Don Hearne (Olive Walsh and Margaret Farrell’s brother) & Joe Rogers another brother of Madeline’s lost their lives on May 1972 down The Harbour while out fishing for salmon on a very wild day for May. In October 1973 a male nurse Martin Flynn from Dunkitt a non swimmer was drowned while climbing from his boat on to the pier in Cheekpoint when he lost his grip. Eddie Gunnip, Passage was drowned in Tramore Bay in January 1975 on a very bad night; his two son’s Willie & Philip as well as Henry Mason were with him and witnessed it. The river Liffey was where Martin Quilty from Woodstown drowned in June 1976. In August 1980 8 years old Joseph Doherty, Cheekpoint son of Robert and Mary Doherty was drowned in Cheekpoint. Pat Pepper, Passage was lost in English Channel from the Bell Rover(1) in November 1981 rather mysteriously. Mrs Kitty Walsh Passage, mother of Willie and sister of Willie Mason who was drowned during the war, was drowned in January 1984 in the Harbour. On August 8th 1995 two men from New Ross John Lacey and Michael Aspel were drowned at ESB Power Station opposite Cheekpoint when their tugboat Ross 1 capsized while helping to berth a large tanker. Paddy Kelly, Crooke and Ballymacaw was drowned while out fishing alone off Ballymacaw in August 1998. In 2003 Dr Jim Molloy, Woodstown very well known in the Passage are was drowned up near Golden in Tipperary while fishing on The Suir in late November 2005 Jimmy Meyler from Ballyhack was drowned near The Saltee Islands from the trawler Rising Sun. In September 2009 Paddy Mason, Passage husband of Margaret and father of her family died when he fell from his boat near Churchtown while tending to Lobster Pots. John Ennis from Ballyhack was drowned in the harbour while trawling mussels in February 2011. Then came the greatest family tragedy in the area and indeed probably in Ireland when The Bolger brothers from Passage, Paul Bolger, Shane Bolger and Kenny Bolger were drowned on June 12th 2013 out near Brownstown Head. Richie Walsh, Barrack St who died on an aeroplane while going to catch a ship he had been sea for years. 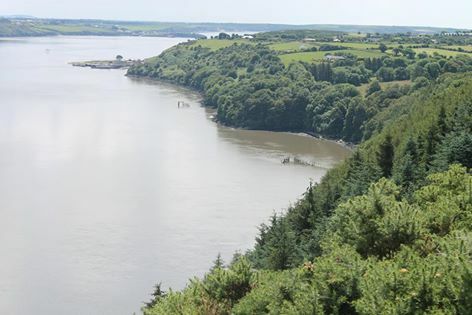 A number of people from outside the area were lost in drowning tragedies while in Duncannon and Woodstown on days out, as were two canoeists also at the mouth of The Harbour. We couldn’t let today go without mentioning the biggest loss of life in The Estuary which occurred on January 4th 1888 when the American fully rigged ship Alfred D Snow foundered with the loss of all 30 on board below in Herreloch Bay with just the Captain’s dog making it to the shore at Creaden Head, the vessel had left San Francisco in August 1887 with cargo of wheat for Liverpool but was blown into The Harbour in a horrendous gale. A small number of bodies were recovered and were buried in Ballyhack Cemetery. There were also a number of ships lost with small crews in the estuary in the period before 1900. Now we come to the Two World Wars eras. Its worth saying first of all that despite these wars the human being has learned little from them when you see the state of our world at the moment in many areas where the lust for power has no regard for the great sacred gift of life.We will take a look at the First World War and the impact it had in this area. 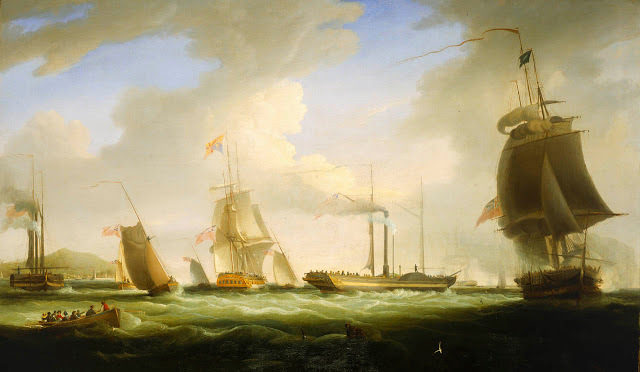 Damien Tiernan gave an excellent presentation last November to The Barony of Gaultier Historical Society on all who perished from all over The Barony of Gaultier both on land and sea, I include those lost at sea from the locality and its environs. Many of the names mentioned I had heard of but others were new to me. My father would have told me of quite a few especially those from the immediate area. All I have named and for a very small number was unable to identify the family they came from both world wars where news traveled very slowly especially the first war and it may not be the family of those involved heard it first it may have been the local Parish priest or Sergeant of the Police in First War or Guards in the second and it could be a month or more after the tragedy. A Sod was then turned in the local graveyards with a short ceremony held. In closing I hope the coming generations in the area will realise why the Memorial Garden is here and that each and every one of the victims will be remembered and never forgotten. Again apologies to any family where some one may have been left out and still left out through no fault of mine. I’d just like to remind people of the forthcoming commemoration of the loss of the Coningbeg and Formby which will be held in Waterford city Friday 15th and Saturday 16th December. This evening Friday 24th The Waterford Archaeological and Historical Society will host a talk on the sinkings in St Patricks Gateway at 8pm. More details here. Cheekpoint and McAplins Suir Inn are synonymous. One without the other seems unimaginable. The family came to the village in 1971 and this last week celebrated 46 years in business in the village. An achievement worth recording in itself, but the pub itself dates to a much earlier time. Anyone who thinks of Cheekpoint, probably automatically thinks of the Suir Inn. In fact if I am away anywhere, be it Ireland or abroad, very often it was easier when describing where I lived to mention the pub. It invariably hit a chord, a memory of good food and good nights entertainment. In my recent book I devoted a chapter to the pubs in the village and I distinctly remembered the McAlpin’s arriving in 1971, Dunstan and Mary and family. They moved from Dublin to take over the pub from Kate ‘Dips’ Doherty, who was retiring. And they quickly became established by firstly providing salmon rolls and then moving to evening meals. In fact in a review some time back Tom Doorly described it as Ireland’s first gastropub. Mac and Mrs Mac as they became known provided a lot of jobs in the village and gave a good price for large salmon too. Speaking of salmon, one knock on benefit, is that the salmon heads were deposited onto the strand and as nippers we had some of the best bait imaginable when we went crab fishing off the quay. As children the village was jammed in the long summer evenings, cars parked in every available space, the quay, green and Strand Road. In fact I remember a time when with the Jolly sailor (Butlers at the west end of the village) the strand road was covered in cars from end to end. I remember one evening when a very uppity gentleman parked outside with an alarm fitted on his car. All the youngsters of the village took turns to cycle past and touch the bonnet. Each time the alarm went off, the self important diner came running out…it never occurred to him to turn off the alarm, we had a night long entertainment, and he must have endured chronic indigestion. There was entertainment of other sorts though. The night Ronnie Whelan of Liverpool and Republic of Ireland fame was spotted inside and we gathered outside for autographs. Of course other soccer personalities were also there, Johnny Giles, Eamon Dunphy and Jim Beglin that I can recall. And there was the evening that one of the Golden Girls, actress Bea Arthur, strolled around the quay. We played cards on Sunday nights in the western corner. Thirties was the preferred game and we all wanted to be with the older players, where the craic was mighty but mistakes could be costly…at least to your ego. There were some characters too Martha Fortune loved her cards, her daughter Susan and her husband Paddy Duffin. Then there was Eddie ‘Butty’ Burke, Mossy O Keeffe and a carpenter from town Frankie Farrell. Frankie was a dry alcoholic who often brought a bottle of whiskey which he hid at his feet. While he sipped a mineral, he topped up peoples drink. His mission it appeared was to get everyone else drunk as he no longer could. Another memorable night was when I got five stars on the lotto. It was years back when the lotto had only started. It took at least a day or more to discover what you had won. I burst into the pub shouting and bought a round of drinks, followed quickly by more and after closing time we headed into town for chips. Next day I realised I spent nearly as much as I won, as there had been dozens of people with the five stars and when divided the pot was paltry! Probably the best nights in the bar when I was there was the Faithlegg NS fundraisers. These were monthly draws which the McAlpins helped to promote, sell tickets and host the draw. Peter Hanlon was there for the music or Brendan Doherty. And all the funds raised went towards the communities efforts to increase the class rooms and keep the school maintained in an era when the government chose not to fund such activities. 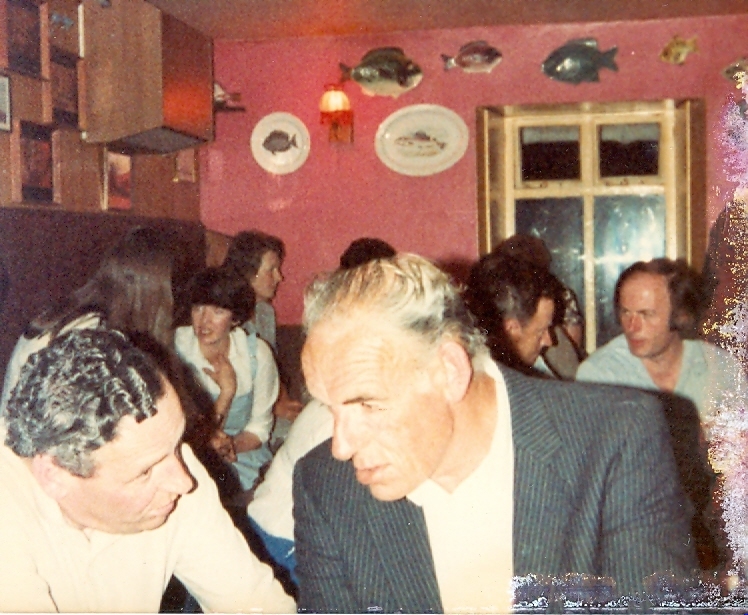 Of course there were earlier eras of music and craic, when families came from up and down river to events in the bar such as the Whitty’s of Nuke, Phil Sherlock from Great Island and many more that I was too young to recall. Dylan Bible recently managed to retrieve the recordings off an old twin track recorded by his grand dad Tommy White with a musical evening in the bar featuring the Duffin family of the Rookery and Sonny Nugent who lived up the street and who was a great entertainer. As regards the age of the pub or Inn, most believe it dates back to as early as the mail packets in the late 18th C which saw Cheekpoint develop as an industrial village. Knowing what we do of society at that time, its probably safe to assume there were many places to buy a drink. Certainly on of my fathers stories of the pub dates to that era. I’ve actually told it to camera thanks to Mark and Derek from Waterford’s Epic Locations. But for those who prefer the written word, here’s an edited narrative of my fathers tale. One thing is for sure, the village would be so much the less without the Suir Inn, long may it continue to survive and thrive. For many years I was intrigued by the copper mining at Bunmahon on Waterford’s coast, but it was only recently I realised that the industry had a connection with one of this pages passions, ships. Bunmahon, on Waterfords coast is home now to the Copper coast Geo park visitor and interpretative centre. The visitor centre brings the working of this mining centre to life in all its glory…or should that be hardship and drudgery?. The mines ran in the area principally between 1825 – 1880 and at the height of production and profitability employed 1200 people. What never occurred to me, until Robbie Galvin the manager of the centre explained it to me, was that one of the key drivers of demand for copper was the sheathing of ships. All ships and boats, have a recurring problem when in water; fouling. They require regular maintenance and cleaning in order to remove weeds, algae and barnacles from their hulls. Not doing so creates problems with steering and speed, and lay ups are costly and, needless to say, hard work. In the modern era anti-fouling paint is easily purchased however in the past this was not so straightforward. In the past various methods were employed to maintain ships. 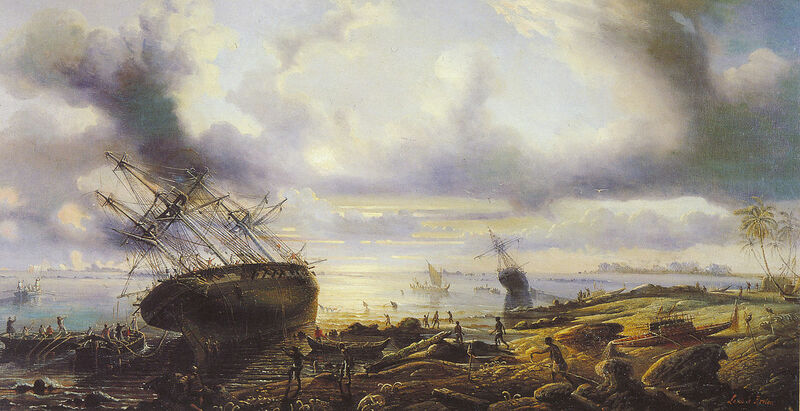 A process called ‘Careening‘ ships was used where ships were beached or heaved over and regularly scraped and maintained. Graving banks were used where “graving” took place. To “grave” a ship originally was a process of smearing a residue of boiled tallow and resin onto her hull often accompanied by the nailing of thin strips of timber to act as a barrier. Eventually the term was used for any area where a ship was overhauled, or even for dry docking. Pitch and tar mixtures were also employed, a process I am no stranger to. The traditional methods of protecting a ships hull from fouling were ineffective against the worms. Other forms of sheathing were trialed. The Greeks and Romans in classical times came up with an idea of using lead, and this was employed but created difficulties, the metal reacted with the ships fixings, eroding the nails and bolts, and leading to ships practically falling apart. Copper sheeting was also trialed, but again the issue of reaction arose. Louis Le Breton – Scanned from Louis Le Breton, témoin des marines du XIXème siècle. In the 1780s, while Britain was at war with France, Spain and the American colonists, her Navy prioritised the need for a solution, in an attempt to gain a competitive advantage. Copper was the preferred method, but it was not until a new copper fixing was developed which worked in harmony with the copper sheeting, that the process could be said to be a safe and workable solution. Although expensive it was a success and the navy started a refit of all ships. 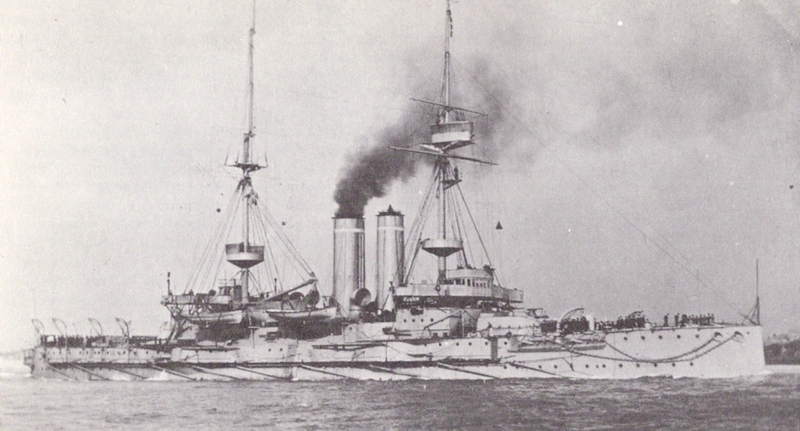 Needless to say her rival navies were soon keen to have the technology too. The merchant marine would be much slower to embrace it because of cost. A new era of ship design was coming however, and although it would eventually see the end of the need for plating, there were many decades of demand for copper ore to come. Copper and her many associated alloys would move inside the ships and it still has a role to play even today. This link from Mick Walsh highlights a modern use for copper in ships as a means of preventing fouling. The Copper Coast is on my mind this week as I will have a stand at this Sundays Book Fair which opens from 1-5. Theres a great line up of authors and book sellers. A great ally of mine when it comes to providing ships photos, Andy Kelly, will be there with a selection of his books too. 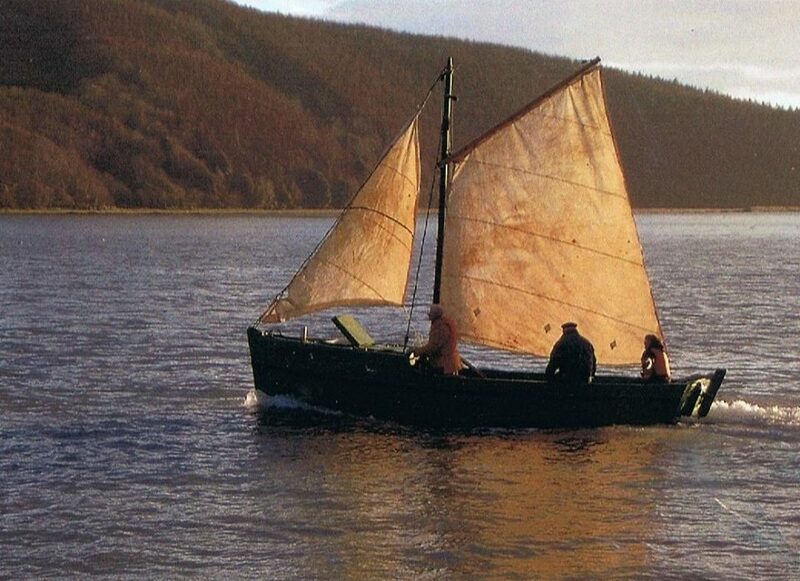 I met with Des Cowman recently wrote a history of the copper coast mines, and Des could tell me that the ore was actually transported in leather bags, by horse and cart to the beach, from there by punt to waiting schooners at anchor off shore. 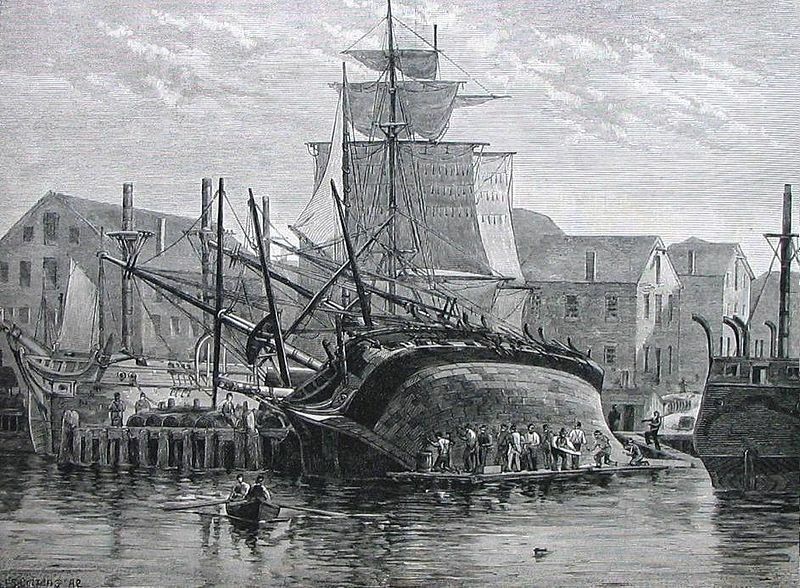 Once loaded the ore was transported to Swansea, Wales for smelting.